When it comes to being successful at grooming your dog at home it is essential to have the proper tools. The most important tools for maintaining your pets coat at home are: a slicker brush, a metal comb, a flea comb and possibly a dematting spray. The brush of choice for getting out tangles and undercoat is the slicker brush. This is a wire brush that has a curve to the pins, which is what helps grab and detangle the coat. It is important to be mindful when using this brush or you can run into issues. How much pressure you apply will depend on the thickness of the coat, size of the dog and area of the body you are working on. Be careful not to brush too hard on sensitive areas, such as ears and bellies. Also be careful not to brush over one area too long or you can cause an irritated spot called a brush burn. As long as you are being careful and paying attention you will do fine. Another essential tool is the greyhound comb. This is a metal comb with medium spaces on one side and more course on the other. It is a great tool for checking your brushing work. After you think the coat is brushed out, it is time to go over it with the course side of the comb and check your work. Some of the remaining snags will comb out, but often times you will find areas that will need to be gone back over with the brush. Try not to pull the hair and make the animal uncomfortable. With ears and tails it is usually possible to hold on to the the hair to avoid pulling it. Another great tool to have around is the flea comb. This is a great tool for checking for fleas (more on fleas in the Seasonal tip section). You will need to make sure the hair is not tangled beforehand for this to be effective. The flea comb can also be used to comb out gunk that can form at the corner of the eye. You will need to catch it before it gets very built up or it will need to be soaked or shaved off. Dogs and cats with long hair or have coats that really tangle easily could benefit from a dematting spray to use during the home grooming. 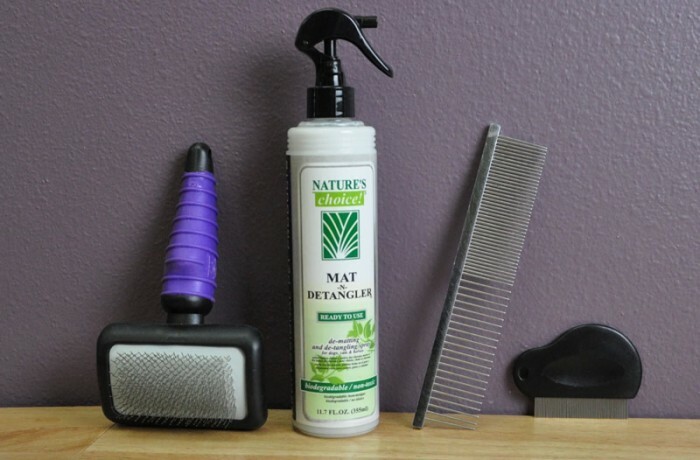 The spray can help facilitate the release of the tangles and matting. Let us know if you have any questions on how to use certain tools, we are happy to help!